Trough Creek Laurel Lodge é uma bela de cinco quartos e três banheiros montanha casa construída em 2. 25 acres e disponível para suas férias de família, reunião de família, ou retiro da igreja pequena. O lodge foi projetado e construído por Judd e Susan Buckwalter e seus filhos em 2011. Era importante para eles que o projeto do lodge proporcionariam uma experiência rústico clássico onde várias famílias poderia férias juntos, fazendo novas memórias e estreitamento de relacionamento. Planejar suas férias é fácil como o lodge está localizado a apenas alguns minutos do Tatman Run lançamento do barco e nadar área em Raystown Lake, e Trough Creek State Park. O lodge é uma vara tradicional casa construída com revestimento de madeira de cipreste do lado de fora e língua de pinho nodoso e groove placas nas paredes interiores. A altura do teto é de 25 'para o ridgepole cicuta expostos e vigas criando uma sensação extraordinária lodge aberto. A sala principal possui um 8 'pé pedra grande lareira, mesa de jantar e estar sala de estar para doze, e cozinha totalmente equipada com máquina de lavar louça. O lodge vai dormir até vinte pessoas. Há cinco quartos composto por oito camas de casal e seis beliches tamanho único. Para o seu entretenimento, temos desde uma nova mesa de bilhar carvalho por herança Billards em Strasburg, Pa, mesa de pebolim, mesa de ping pong, alto estilo mesa de cartas de nogueira, e 46 "de televisão de tela plana com DVD player e uma variedade de DVD (sem cabo ). Para sua conveniência, uma máquina de lavar e secar roupa são fornecidos. The 5 bedrooms let everyone spread out. This was our first stay at this lodge and we’ll definitely be back again. Very well kept with all the amenities and a great fireplace! We had a wonderful time in this wooded retreat. There was plenty to do for our group. The kitchen was well appointed and the sleeping arrangements were ideal for a group of families. This charming and gorgeous cabin was very relaxing and comfortable for a Moms getaway weekend. We all loved that we could sit together at one table to enjoy our meals and board games. The cabin had everything we needed to unwind and relax. The unexpected 12 inches of snow in November made it even more picturesque. There was plenty of room, beds and bathrooms for 10 Moms. We are hoping to go again next year. 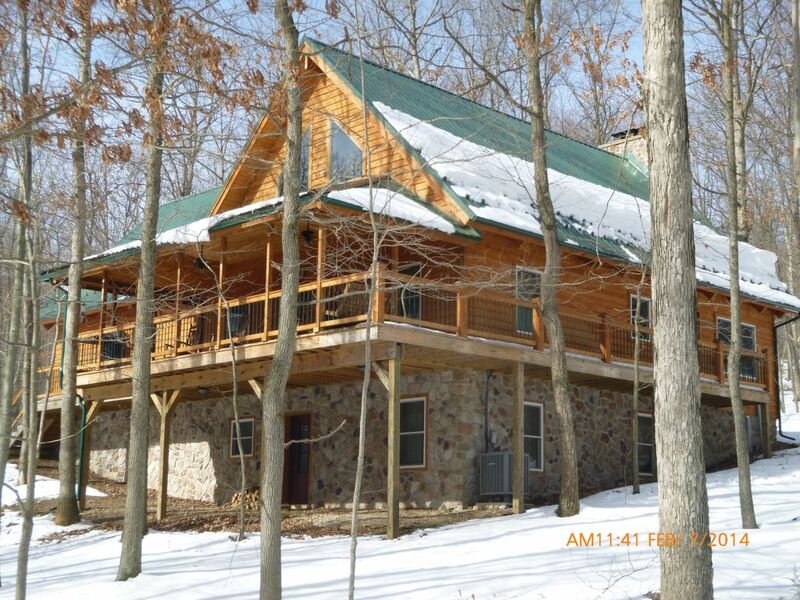 This cabin is a terrific place to spend together with family and still have space to have time to yoursellf . The location of the property is also very convenient to alot of activities. We will be back to visit again soon . This lodge housed our family of 3 adult siblings and spouses along with 10 adult nieces and nephews with plenty of room for all. Having a full bath on each of the 3 levels was great. The kitchen was fully equipped - we even used the crock pot! Refrigerator held all of our foods - although we did, as recommended by the owners, put drinks in coolers out on the porch. The porch is equipped with plenty of comfortable chairs, rockers and even a swing and turned out to be a great family gathering spot. The indoor furnishings are great too - huge dining table with comfy chairs was perfect for meals and card games. Loads of pillows - remember to bring your own linens (the washer and dryer work well so that's a plus) and bring your own firewood BUT there is plenty of wood in the forest surrounding the house so if you bring an axe and someone to chop - you'll be able to stock the campfire. Proximity to Trough Creek State Park is about 5 minutes so a family hike along the Rhodedendron Trail was a must - the trail crosses a suspension bridge, hugs a wall of rocks overlooking the creek to a waterfall. From the waterfall, you can ascend stone steps to Balanced Rock - beautiful. We had so many in our group that some fellow hikers asked if we were on a bus trip! The owners were courteous and so helpful answering some of our pre-trip questions - this is the 14th year we've done this reunion but the first time at this property - we give this all thumbs up and hope to be back next year. Stay longer and save more. Our rate is $320 per night, $860 for 3 nights ($100 savings), reserve 4 nights save $200, reserve 5 nights save $300, reserve 6 nights save $400. Our rate of $1,640.00 for a full week reservation amounts to $600 savings. Please wait for our final quote as the automatic quote does not calculate savings for 3, 4, 5 or 6 nights correctly.